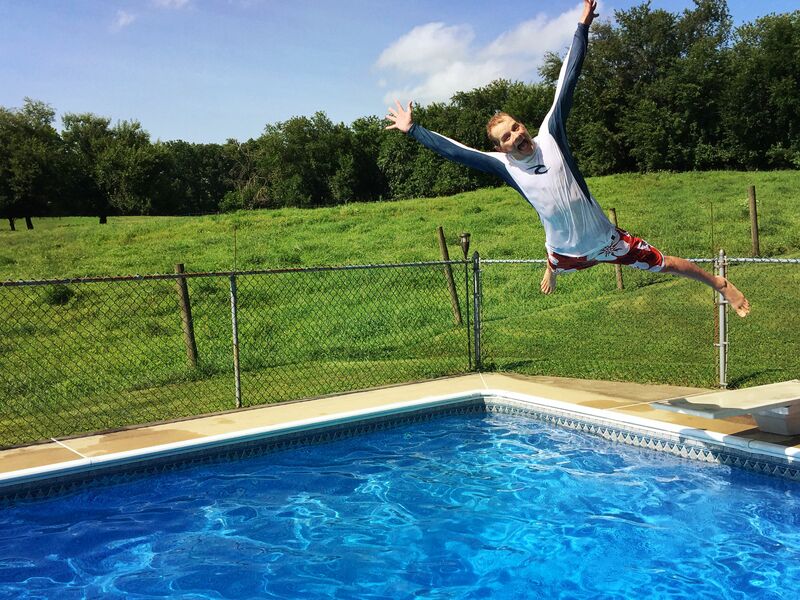 Silly acts that fill my heart with gratitude for life, health, and a donor that made it all possible. Can it be true that the end of summer is here? A few weeks ago I had a friend ask me if I had any blog posts planned. I answered, “Yes! I’ve got lots of them planned… but I’m too busy living life.” She simply responded, “Good! That’s how it should be!” She understood what I was implying. It wasn’t that I had a crazy hectic schedule and no time for blogging. It wasn’t that I didn’t want to do it. Instead, for the first time in what feels like a long time, our lives were not being dictated by disease and doctors and we were enjoying it to the fullest. 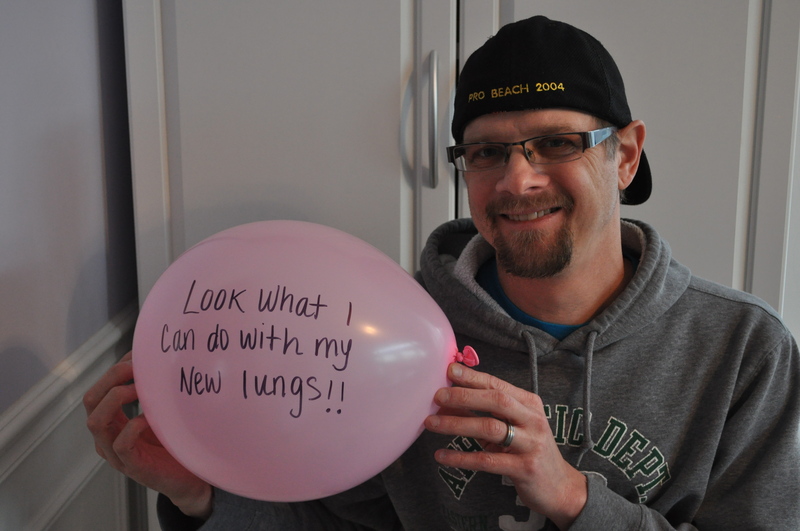 June marked nine months since Jody’s double lung transplant. Throughout this first year he has had bronchoscopies done every three months to check for rejection (some types of rejection can only be identified by tissue samples taken from the lungs). Praise God his bronchs have continued to show no signs of rejection! We did learn at his nine month bronch that one of the internal wires used to hold Jody’s ribs and sternum together is broken (which we suspected). At this point his bones have fused together well enough that there is no need for concern. The loose wire rubbing does cause Jody mild discomfort but as long as it is tolerable the doctors prefer to leave it alone. 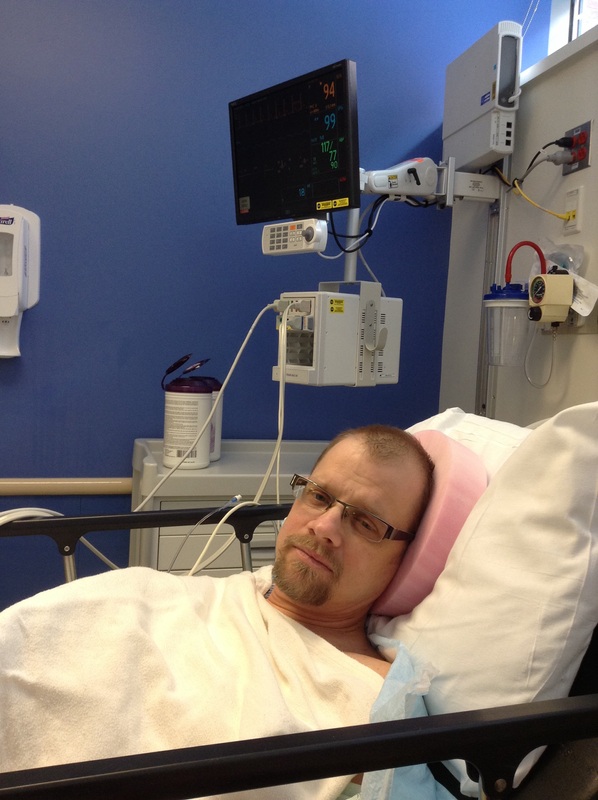 Jody has made great progress and in June he was cleared to move his transplant clinic visits to every three months. This was a huge, exciting step for us! 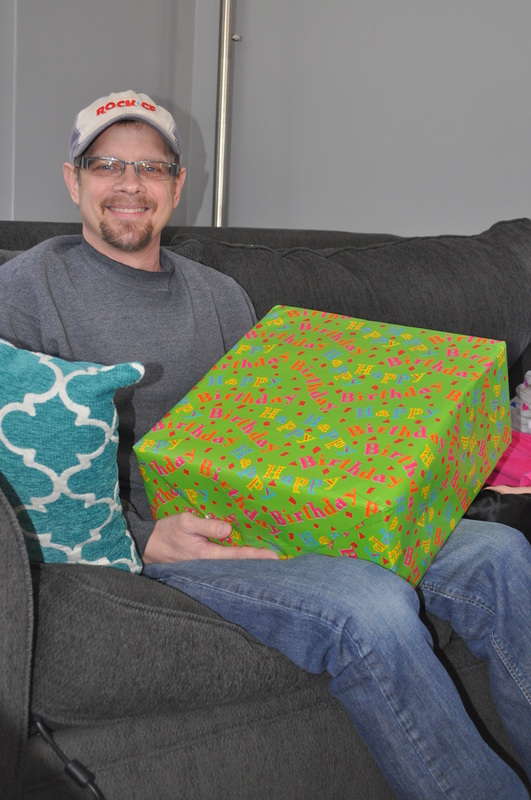 Throughout his life Jody had routine check-ups for his cystic fibrosis every three months. In the last few years those visits became much more frequent. The year before transplant it felt like Hopkins had become our second home. After transplant the visits to our second home continued weekly, bi-weekly, every three weeks, then monthly. Clinic days are long and take up most of the day, especially when driving time is factored in. You can imagine our excitement when in June (nine months out), Jody was cleared for visits every three months. 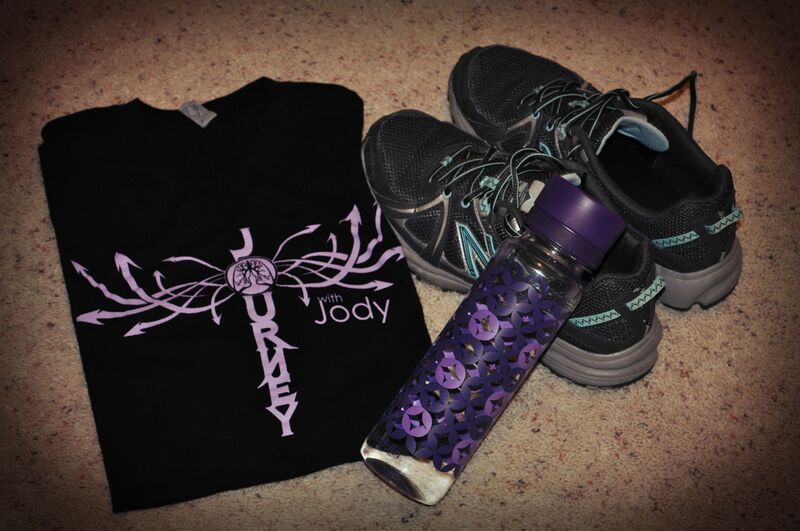 It has been years since Jody has been able to go three months without seeing a doctor. Oh the freedom every three month visits brings! At home Jody was also cleared to bump his weekly bloodwork to every other week. The doctors had a hard time finding the right dose of one of his anti-rejection medication because it frequently showed up too high or too low in his blood. Finally, after nine months, they seem to have found the dose that is right for him, which is why he is now drawing his labs every other week. 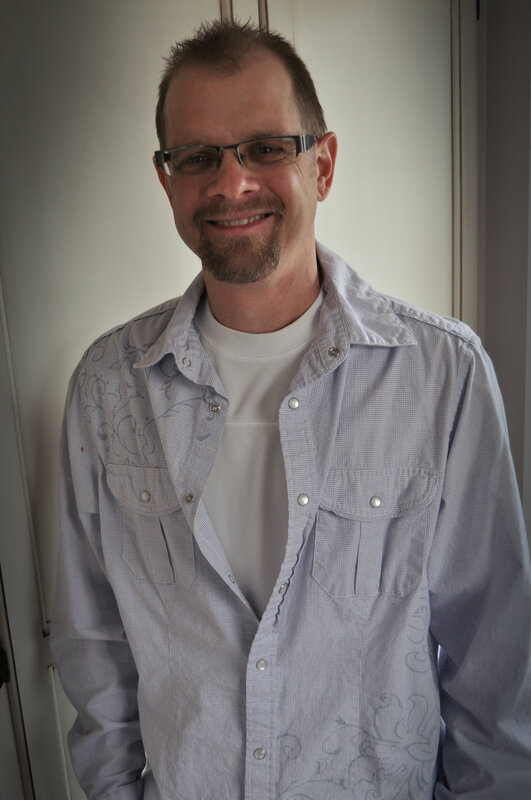 Jody continues to monitor his vital signs and lung function twice a day so he can pick up on the slightest change and alert his medical team. Today we sent our oldest daughter off to first grade. Not only does this signify the end of summer but also the nearing of the first anniversary of Jody’s transplant. How different our lives are today from a year ago. I remember how hard it was for me last summer to be constantly (or so it felt) inundated with pictures and status updates of all the wonderful things people were doing and fun places they were going over the summer (thanks in part to the prevalence of social media). Instead of sunny days spent at the pool or beach, many of mine were spent at a hospital bedside, and with concern for the life of my husband. 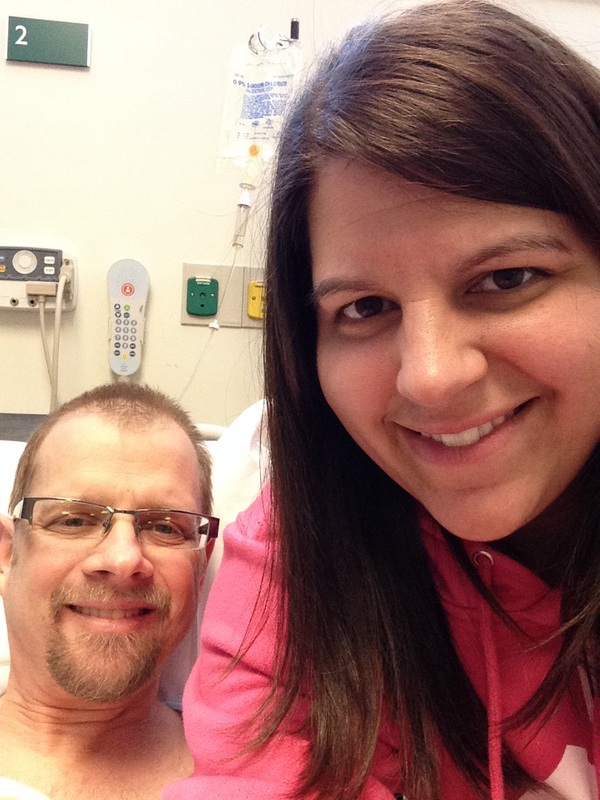 Last year Jody and I even celebrated our ninth anniversary in a hospital room. I’m so thankful that this year, we rang in our 10th anniversary on the beach. It was one day, but it signified a lot more than that in my soul. It was the return of life and of things enjoyed. The rest of our summer included countless afternoons by the pool, multiple day trips to the beach, the Baltimore zoo, Lake Tobias, play dates, the Minion movie, birthday parties, time at the park, horse rides, fishing, Jody teaching a painting class of 40 people, a crabbing trip, a truck show, date nights and more. Our summer did not include any hospitalizations and only one doctors visit in the beginning of June. The ending of summer is bittersweet. It has been so good and full of health. My stress level naturally climbs at the thought of the approaching cold and flu season and the diligence it requires to keep Jody healthy. But it’s worth it! I pray that God would continue to protect him from the germs that surround and that the upcoming winter would be just as awesome for our family as the summer has been. It’s been nearly two months since my last post. I owe you an update on Jody, and I plan to do that soon, but I’d like to use this post to tell you about the CF walk we participated in last month. Each year the Cystic Fibrosis Foundation holds nearly 600 walks nationwide to raise funds for research and drug development for CF. They term these walks “Great Strides” events. One of the things I enjoy the most about this event is being in the presence of so many people who know and understand Cystic Fibrosis. It seems like almost every day of my life I need to explain CF to someone, and while I’m happy to do so, and consider it a calling of sorts, it’s a relief to be in an environment where I don’t need to do that (even if for just one day). It was fun to meet other CFer’s and CF caregivers, and to encourage them to press on in their fight against Cystic Fibrosis. We walk for a cure for Cystic Fibrosis! 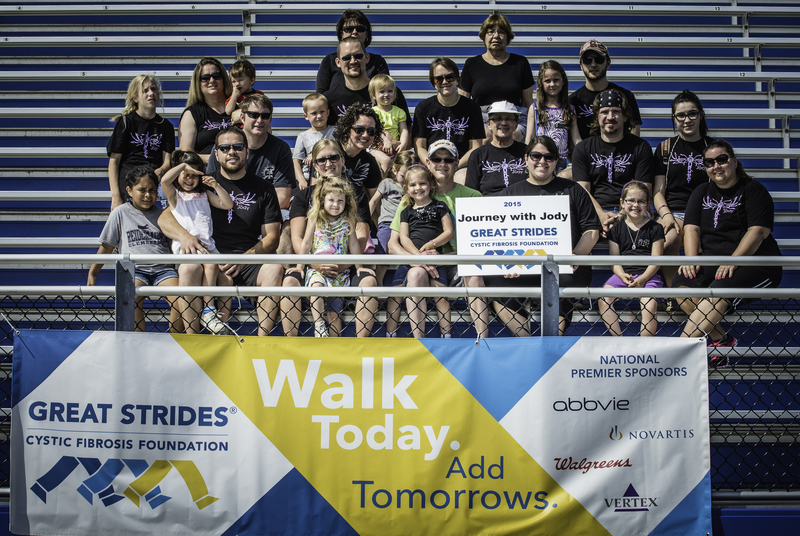 Jody and I would like to thank those of you who joined us for this walk; your support meant more than you know. Likewise, we are appreciative to all the people who made a donation to our team and ultimately helped those living with CF. 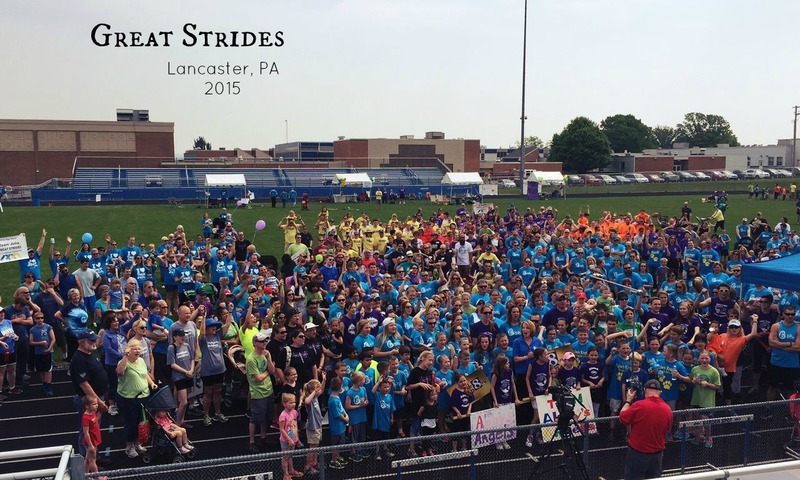 Would you believe this one-day Lancaster Great Strides event raised over $172,600?! Can you imagine how much is raised nationwide? This is exciting for those of us that have been touched personally by the work of the CF Foundation and hope for a cure for the disease. At the walk Jody and I were privileged to say a few brief words and share a portion of Jody’s journey with those in attendance. I am continuously amazed at the reach of Jody’s story and although it has not always been an easy road, I hope that we are able to use it to encourage others. At the walk I was also able to meet a few readers of this blog and it was fun to hear your stories (thank you for introducing yourselves to me). Overall it was a fun morning of hanging out with friends and family, raffles, photos, exercise, lunch, and most of all… supporting a cure for Cystic Fibrosis. FYI: Per the guidelines of the Cystic Fibrosis Foundation for outdoor events, people living with Cystic Fibrosis need to maintain a six-foot distance from one another to prevent the spread of bacteria and cross infections. In order to make those with CF easily identifiable at the walk, anyone who has the disease is given a green shirt like the one Jody is wearing and is asked to keep a healthy distance from anyone else with the same green shirt. Jody encouraging his fellow CFer’s. WGAL News 8’s Lori Burkholder was the event emcee. Enjoying lunch together after the walk. Adrienne (left), Executive Director of the Central PA Chapter of the Cystic Fibrosis Foundation. Thank you for all your hard work. 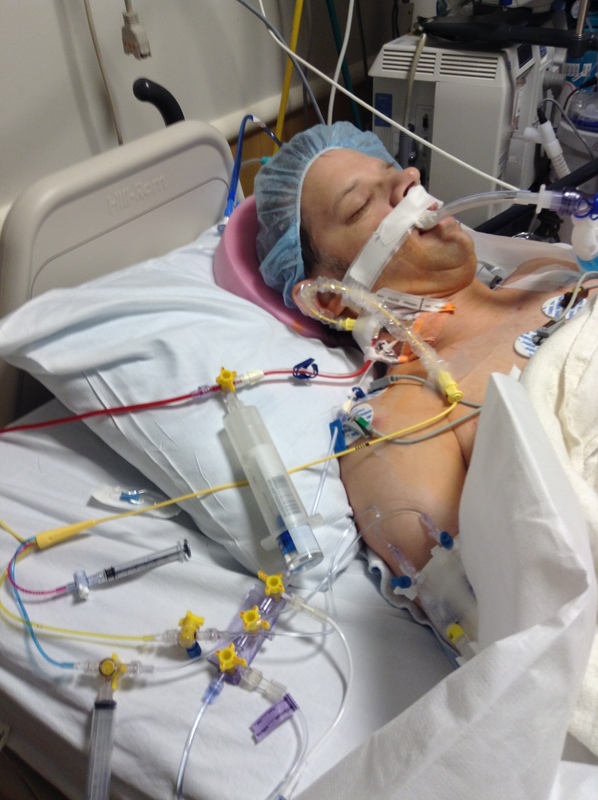 As I begin this post I struggle for words to adequately describe the significance of Jody’s new lungs. When you have watched a love one suffer, increasingly, for any period of time, it hurts deeply. When you live in fear for said loved one’s life, it’s hard and scary. When you bear witness to said persons healing it’s incredibly amazing and freeing. The gift of life, at the expense of another, one that can never be repaid, is so very humbling. The challenge then becomes, how can I (we) honor and protect that gift? Never again do I want to see Jody struggle for breath, to be separated from him time after time by a hospital for the sick. To live in guilt because I’m not enough and can’t give my all to everyone who needs me (spouse, children, work, etc.). 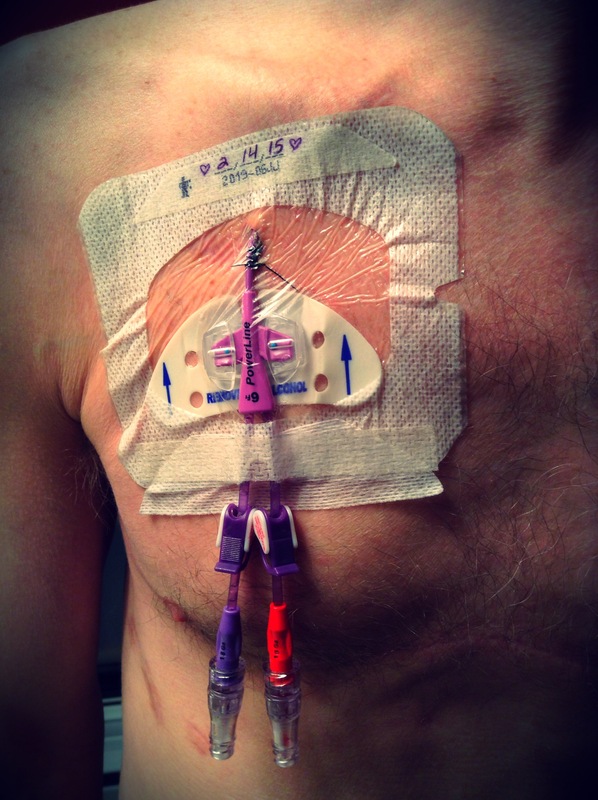 In some ways Jody’s transplant has made me almost more fearful of the future. I will never forget how sick he became two weeks after transplant when he developed aspiration pneumonia and was transferred back into the ICU. 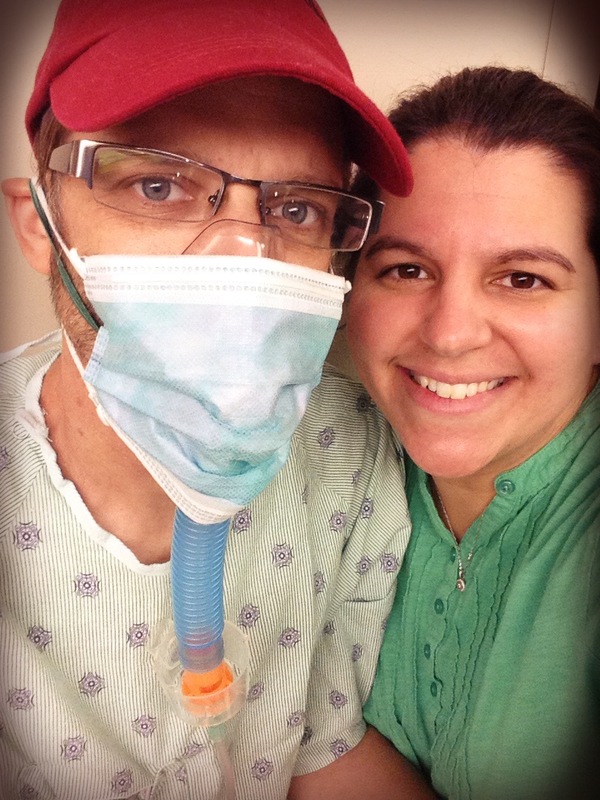 I remember sitting at his bedside, thinking to myself, this is what it’s going to be like if he gets a hard-to-treat infection, his new lungs stop working or they go into serious rejection. I’m going to watch him struggle and suffer only this time, the end will come, and I will be left a young widow, and mother. Obviously I don’t know what the future holds and I hope my vision from the hospital is far from the truth but either way, I will do everything in my human power to protect Jody’s gifted lungs and keep him well. I want him around for a VERY long time! That being said, I thought I would use this post to share with you some of the guidelines we live by. 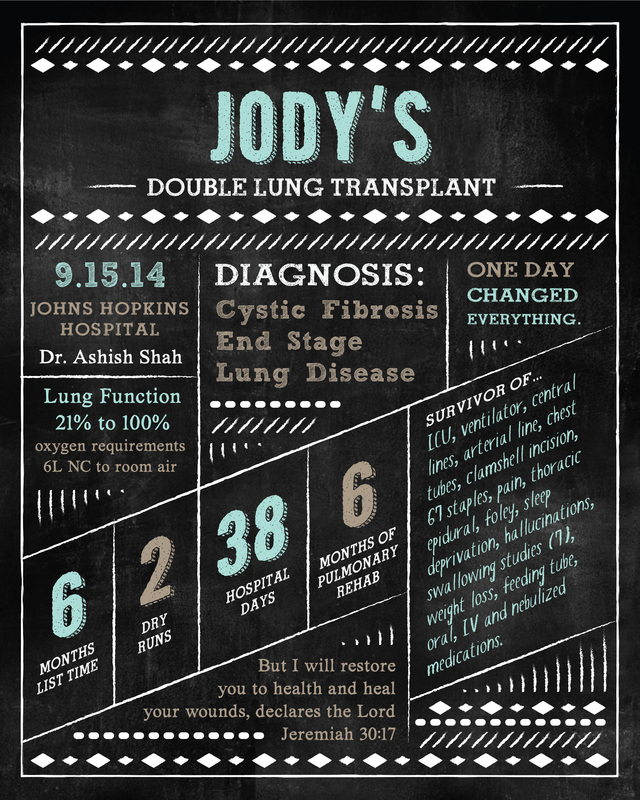 You might remember in the hospital after Jody’s transplant we received a three-ring binder, Jody’s “Owner’s Manuel for life,” they called it. 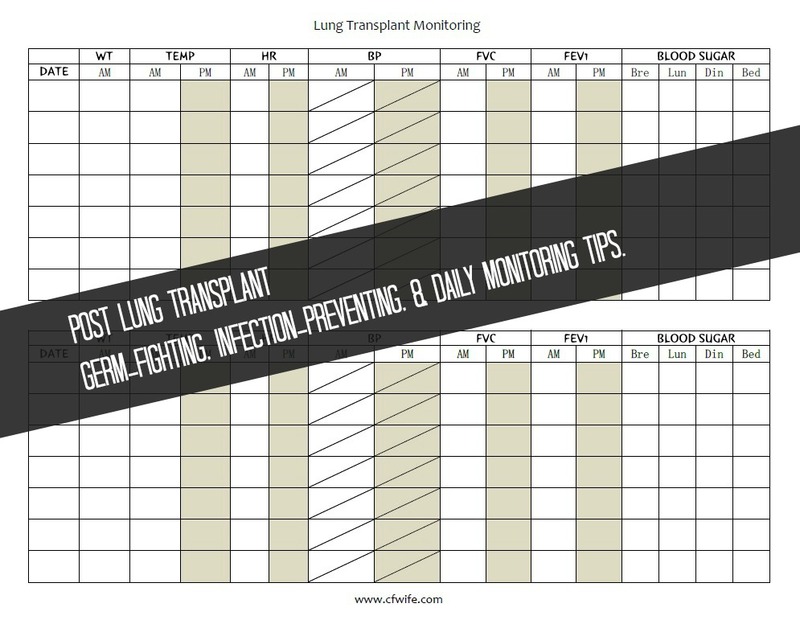 This binder is full of information about post-lung transplant life and holds guidelines for practices which prevent lung infections. Common infections can become very serious and even life-threatening for one with a weakened immune system. The list below was given to us by Jody’s transplant center, Johns Hopkins, and if you are a lung transplant survivor, you probably have similar guidelines given to you by your center, which I encourage you to follow. • Wash your hands with soap and water frequently, before eating or drinking, and after using the bathroom. – This one is kind of a no-brainer. – We take this guideline VERY seriously. • Wear disposable gloves for any high risk situations. • Never change diapers of an infant, and avoid any direct contact with an infant who has received oral polio vaccine in the last six weeks. – Thank goodness we’re out of the diaper stage. • Avoid individuals who have been vaccinated with any live virus (chicken pox, measles, mumps, rubella, nasal flu) for at least two weeks. – So, friends, family, please stay away if this is you or your children. • Avoid individuals who did not receive the flu vaccine. – We’re especially thankful to our family and friends who got the flu shot (even though they preferred not to) so they can continue spending time with us. • Wash fresh fruits and vegetables thoroughly and/or peel skin before eating. • Be sure that all ground meat, chicken, fish and pork are thoroughly cooked before eating. – Actually, we have an entire paper filled with foods from all food groups that Jody is to avoid, such as common cheeses, salmon, crab, sliced deli meats, store bought salads, well-water, brewed tea, raw honey, and the list goes on and on. • Cook eggs until the yoke is solid before eating. • Do not eat raw cookie dough or “lick the bowl” when preparing cakes. • Use only plastic, dish washable cutting boards. • Do not eat at buffets. – This is due to the risk of bacteria growing on food that has been sitting out for too long, possibly kept at improper temperatures, as well as the risk of infection from people touching the handles of the serving spoons. • Avoid large crowds, especially in close quarters indoors (movies, concerts, plays, religious services). If this is not possible, wear a mask, and wash your hands frequently. – We are church-going people so this one is challenging for us. 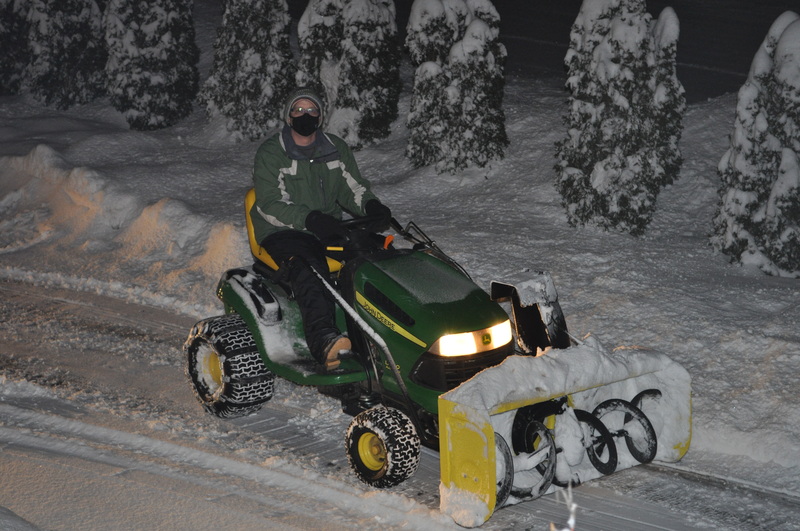 We did stay home during most of the cold/flu season this year, especially with Jody being so freshly transplanted. My concern is actually less about Jody (he can wear a mask and wash his hands), and more about our young daughters picking up something in the over-crowded classrooms, and bringing it home. In fact, our first Sunday back with the girls that is exactly what happened, much to my dismay. I’d like to add that if I’m sitting beside you at church and you see my sanitize my hands immediately after shaking your hands, don’t take it personal, it’s not that I think you might be germy (or maybe I do), I’m just trying to keep my family healthy. • Be aware of people around you – If someone seated near you is coughing or sneezing – get up quietly and MOVE! These precautions are especially important during flu season (October thru March). – Sometimes I think I’m a little too aware of the people around me. I can pick up on someone coughing from across a room. I cringe when I see people coughing into their hands or blowing their nose and not washing their hands or using hand sanitizer afterwards. I can envision their germs spreading onto everything they touch afterwards. • You should never participate in gardening or digging in the dirt (fungus and mold live in the soil and grass). 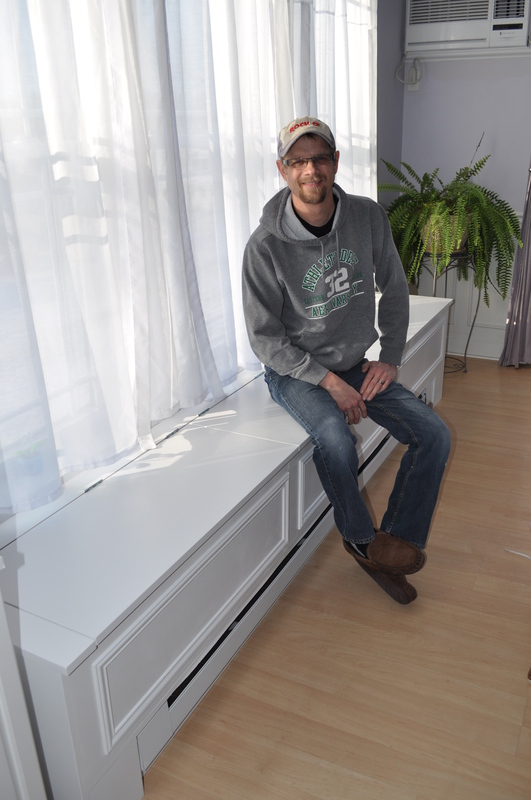 – This is a hard one for Jody since he enjoys working in the yard and even went to vo-tech for landscaping. I, on the other hand, don’t enjoy yard work. So if you drive past our house and see lots of weeds growing, you’ll know why. • NEVER empty kitty litter or clean the cat litter box. • Avoid kittens at all times. Adult cats may present a lower risk of giving you an infection but can also be a problem. – Good thing we’re not cat people. • Avoid all birds and their droppings. • No traveling/flying in an airplane for at least one year following transplant. • When flying in an airplane you must wear a mask and keep the air vent closed. • When outside in the sun, wear protective clothing, broad brimmed hat, sunglasses, sunscreen and lip balm. The best times to be outside are early morning and late afternoon. Transplant meds make the skin more sensitive to the suns rays, resulting in high risk for skin and lip cancers. You must see a dermatologist yearly to watch for changes in your skin. • Anti-rejection medications are time sensitive and must be taken twice a day (every 12 hours) FOR LIFE! • Every day (twice a day) you must monitor and record your weight, blood pressure, heart rate, temperature, home lung function, and blood glucose levels. Bring these with you to all clinic visits for review. I imagine there are people around us who might not understand and think us extreme. Perhaps they’re tired of hearing us say that we can’t do something because of Jody’s transplant. Those people have probably never lived in a hospital or were faced with the real possibility of losing the love of their life. Once you’ve faced that, you never want to experience it again. I don’t ever want to see Jody, oxygen saturation dropping into the 50’s, gasping for air, barely able to move, out of his mind with hallucinations, and/or on a ventilator. The truth of the matter is that while I daydream of being “normal” I’m happy to be my germ-crazed self because it means that I have a reason to be this way. If Jody was not living, I could be “normal” and much less fearful of even the common cold, but he is worth every germ-fighting, infection-preventing routine we practice (and even the few gray hairs that I’ve acquired along the way). * I apologize to all the email subscribers who I confused by accidentally (and prematurely) hitting the “publish” button while writing this post. Oops!